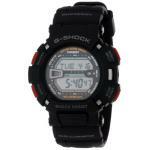 Casio G-Shock G9000-1V Expert Reviews - Read Reviews and Buy Smarter Online. Verdict: I like the durability of G-shock watches. I am going on purchasing my second G-shock watch. I like how large the Day displays on the watch. I like that it illuminates at night. I illumination can be set for 3 or 5 seconds. I like the durability of the bands.